This beetle is much smaller in real life than this picture. 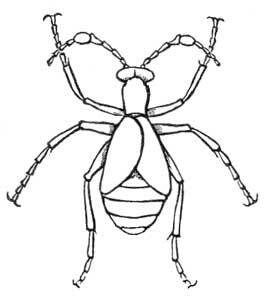 The Meloë beetle is a somewhat parasitic pest that can infect bees and their hives. He can secrete an oily substance that can cause painful blistering and swelling. While not a pleasant fellow in real life, this beetle picture would make an interesting addition to your next crafting, mixed media, scrapbooking or website project.